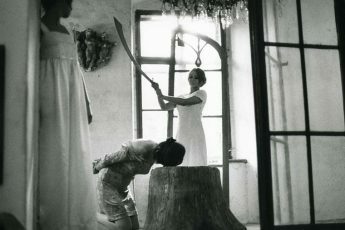 It is hard to watch Frantisek Vlácil’s 1968 movie The Valley of the Bees (Údolí včel) without comparing it with the liberation movement of the Prague Spring that lasted until the end of summer of that same year. 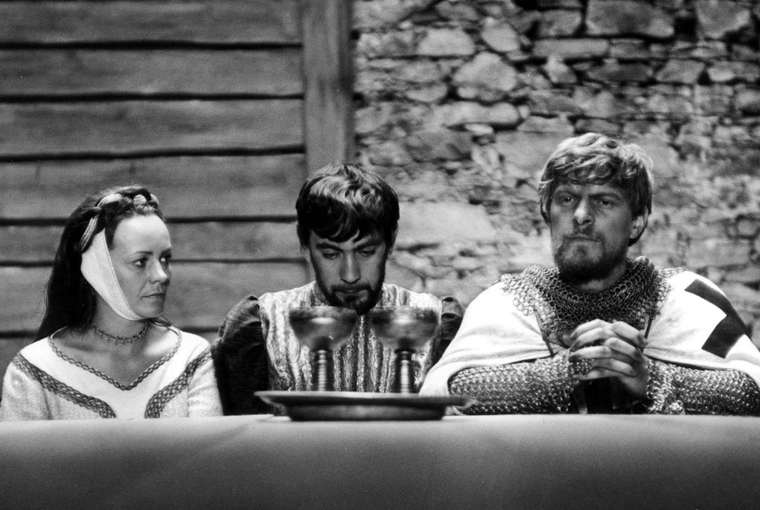 Although set during the middle ages, the film is essentially a meditation on the question of ideology, whether to repudiate it or not, and if yes, by what means. Portraying the story of a political traitor, the film perpetrates historical meaning, perhaps in spite of itself. It thus reflects the resistance attempts in Czechoslovakia against the repressive political and social conditions of the Soviet regime. Ondrej is the son of the sovereign of a remote village in 13th century Bohemia. He’s given over to an anonymous Christian Order when he refuses to accept his father’s new wife, who seems to be closer in age to Ondrej than his father, as a mother. At the convent, he is raised by the overly devout Armin von Heide, who spends most of his life fasting, crusading, and searching for salvation. Armin is an obedient minister to the religious policies of his time. But he has one thing in common with his young friend. They are both fascinated by the sight of the endless sea, which soon turns out into a metaphor for a distant promise. But the magic of distance is deceiving. It only allows them to dream about the possibility of escape. To actually renounce the Order that keeps them on land does not seem to be an option. But unlike his older companion, Ondrej soon begins to disagree with the restrictive rites of authority. He finally runs off after spending some time in prison for having been innocently involved in the escape plan of a fellow knight. Armin’s ambivalent relationship with freedom is most visible when he returns to the ocean, knowing that Ondrej has left. At the sea shore, he carves a cross into the carcass of a wrecked ship. While it seems as though he would like to leave, he stigmatizes the object which most resembles this escape, the ship. This seems to be a self-punishing gesture, indicating the defeat of his desire through the symbol of the order, the cross. While Armin isn’t able to leave the place that has become most dear to him, he too, will part from the convent in a mission to reterritorialize his erratic friend. The two knights thus come to represent ideological oppositions. Armin identifies with the honor of the order, and is stubbornly attached to its principles. He never acts from his own thoughts, to the point that he is indifferent about his own death. His actions are “decided” by a fantasy, a fantasy in which he reappears as a bodiless avenger of divine right. In running after his friend who has just returned to the real world – the valley of the bees – Armin runs away from it. Like in the scene with the boat, he wants to rule out everything that represents escape, even his friends. The paradox is that now he is also running away. The closer he gets to life the further he arrives. This paradox can be seen very clearly in a sequence where Arnim meets a blind woman on his way to find Ondrej. He tells her that he is in search of his brother, meaning Ondrej. After a sparse exchange of dialogue, she asks him to touch her, which he refuses to do, then telling her that he has neither a mother nor a family, and that he serves no mortals. The woman, noticing the contradiction (his claim to have a brother), then asks him why he is looking for his brother, not understanding his logic which is that if he is no mortal, then his “brother” isn’t either. Ironically, Armin doesn’t want to be seen, a desire that not even a blind woman can fulfill, she tells him “I see you”, just before he leaves. Fatally though, it is the same desire that eradicates the possibility of his own existence. When Arnim dies in the end, it is this fantasy that makes his death an impossible death, because it is the death of a life that was not possible to begin with. Ondrej, on the contrary is attached to life and to the natural demands of his body. He prefers life under cowardly conditions to the honor of death under abstract values. Returning to his natal village, Ondrej marries his late father’s wife, yes, the one he refused to accept as his mother, thus literally returning to the valley of the bees, where both Milk and Honey flow. It is worth considering the significance of milk in Vlacíl’s film. In the sequence with the blind woman, Arnim refuses to drink the milk she offers him, perhaps remembering an earlier scene, where he drinks water from a fountain and is mocked by an ugly knight who comments upon his action, “fair bride, give me to drink”, quoting a sentence inscribed above the fountain. Responding that he cannot read, he again refuses to understand the meaning of this sentence, which is, like the desire of the blind woman to touch him, attached to pleasure and knowledge about his own position on earth. In a radical way, Ondrej differs from Arnim, identifying with his actions and not the abstraction of a fantasy. His strength is being able to decide, which results in a kind of self-constituting process, that he would not have been able to experience up till now. It was his father who sent him to the convent, where his food, clothes, prayers and conduct were decided for him. He gives up this passive position, actualizing himself, and moving towards a life in the infinite variety of the natural world. But, as noted above, it is this actualization that seems to be Armin’s closest desire, even if he is unable to realize it. Finally then, Armin is also hunting down his own desire, which becomes the essential motivation to kill his friend. He only succeeds in killing Ondrej’s wife, who offered him honey to drink, shortly before he cuts her throat. Again it is the drink here that embodies the natural existence he desires but has to get rid of, precisely because he would otherwise have to accept the drink that would poison his fantasy. There is another scene that underlines the importance of drink as a substitution for Armin’s desire. In order to flee from Armin, who caught Ondrej and forced him to go back with him, Ondrej knocks Arnim down, at a moment where Armin is drinking. Armin admits to his thirst, not for water, but for precisely the desire his friend just tried to pursue, telling him that he has been thirsty ever since coming back from Jerusalem. So what Ondrej knocks down is the metaphor that tied them together during the beginning of the film: the dream, the deception, the magic of distance. But in the end, Ondrej kills his friend, using the same methods the knights from the Order used against people like himself : letting him be eaten alive by a pack of dogs. The last sequence shows Ondrej at the seashore, dressed in the outfit of the knights. Thus Ondrej too, finds his way back to the metaphor, gazing over the horizon of the sea. Was escape not possible, liberation an illusion? Perhaps, in the end, the magic of distance revealed a paradise, that like a mirage, vanished, along the way. The Valley of the Bees is a film about making decisions in a world where there is little or nothing left to decide. Decision-making remains crucial to every liberalization because it involves having to act independently and establish a conscious position against the conscious-thwarting standards that it is trying to overcome. It is worth thinking about, whether Ondrej’s return to the sea at the end of the film is really a relinquishing of the activity he tried to pursue or whether it is a necessary grief over something he has finished with.